Size of Male: 45-60 lbs., 18-20 in. Size of Female: 45-60 lbs., 18-20 in. With its characteristic hippopotamus face, Doberman Pinscher-like physique, black tongue, generous wrinkles and sulky expression, the Chinese Shar Pei is a standout. Though not the most affectionate of dogs, the Shar Pei is one of the most loyal and protective. In it you will find an undemanding pooch that does just fine without constant attention. “Shar-Pei” literally means “sandpaper-like skin.” The dog traces its roots to Southern China, and ancient writings confirm that the breed existed in as early as 200 B.C. The Shar Pei then served as the companions of lowly peasants. It guarded the farm, herded animals, fought other dogs and hunted boar. For a time, the Shar Pei became so near extinction that they were once recorded by Guinness as the world’s rarest dog. Luckily, the few dogs that were transported to Taiwan and Hong Kong helped raise the numbers. The breed today enjoys fame across America. You’ll even see many of the dogs earn praise for their superb agility, tracking skills and obedience record. Owing to the Shar-Pei’s history with fighting, the pooches tend to be aloof among housemates, wary of strangers and aggressive towards other animals. You may want to consider getting another dog if you have cats at home. Given early socialization and training, many Chinese Shar-Peis, though loud snorers, turn out to be mild-mannered with children. The dogs are more suited to guard you and your home than to tug at your heartstrings. Living Environment – No yard is necessary, but a fenced one is ideal. This is because the Chinese Shar Pei can easily chase after livestock and after your next-door neighbor’s smaller pets. Note that the breed is not meant to live outdoors exclusively. This dog breed does not respond well to hot temperatures. A cool atmosphere is crucial to the breed’s survival and happiness. Grooming – Generally, coat care is minimal, but it’s the shedding that you should prepare for. The Chinese Shar Pei coat consists of three varieties: a short “horse” coat, a one-inch long “brush” coat or a lengthy “bear” coat. Among the three, the bear coat sheds the heaviest, but the other two shed as well. In addition, regular cleaning of the wrinkles and skin folds is advised. Diet & Exercise – Unlike the usual canine diet, a Shar Pei’s meal should be low in protein. The recommended protein content is a maximum of 21 percent of the entire meal. Do not feed your pet table scraps and commercial foods. According to experts, the preservatives found in synthetic food choices can cause skin allergies and stomach complications in this dog breed. 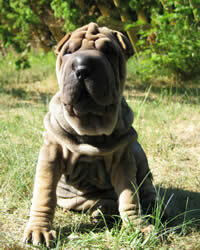 The Chinese Shar Pei breed has plenty of stamina that they need to disperse via regular exercise. You can help them fulfill their exercise requirements through brisk walking. Just be mindful of the weather conditions and avoid excursions during the heat at midday. Health – For a tough pooch, the Shar Pei is ironically a fragile creature in the area of health. Kidney trouble, as well as chronic heart diseases and eye problems are only some of the conditions that plague the wrinkly pooches. A fever of unknown origins is also known to afflict the breed. Swollen hocks typically precede the onset of the fever. You should definitely be tight with your favorite veterinarian if you plan on raising a Shar Pei. Suited for the experienced pet owner, the Chinese Shar Pei can be quite a handful to train. The dogs are very intelligent, but they tend to resist being ordered around. Experts suggest early crate training coupled with socialization. With the right reinforcement, the Shar Pei can steal the spotlight in obedience exhibitions. They are relatively easy to housebreak. I love my Shar-Pei "Ty". I've had him since birth, he was our "pick of the litter". I own a 10 year old male Shar-Pei. He is by far the best dog I have ever had.